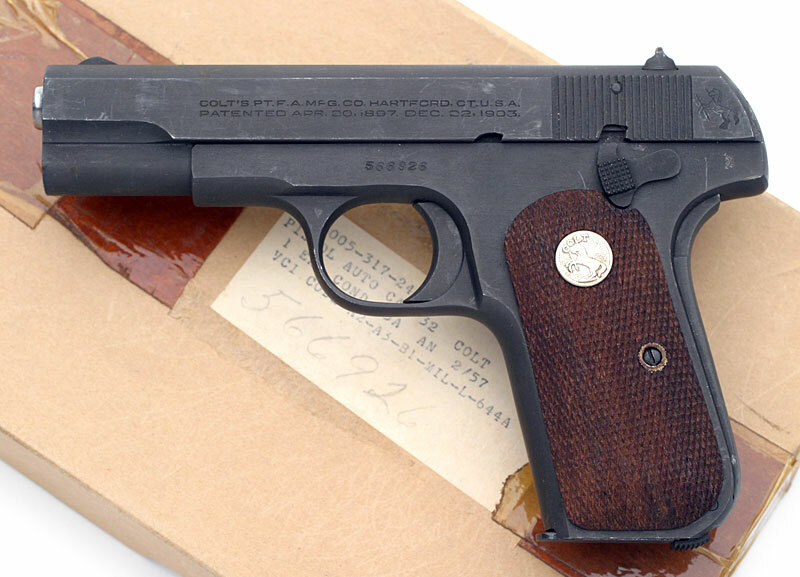 Colt Model M .32 ACP serial number 566926 - Military Model M .32 ACP pistol, issued in 1958 in large 1911 style kraft box, parkerized finish, with U.S. PROPERTY mark on right side of frame and ordnance mark behind the thumb safety on the left side of the frame. 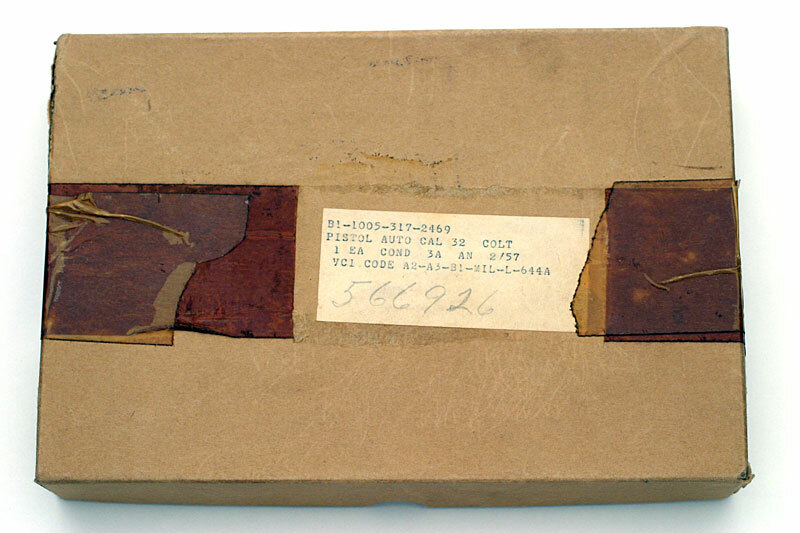 Pistol is documented as having been issued to Major General Oliver C. Harvey and is pictured with the original box numbered to the gun. 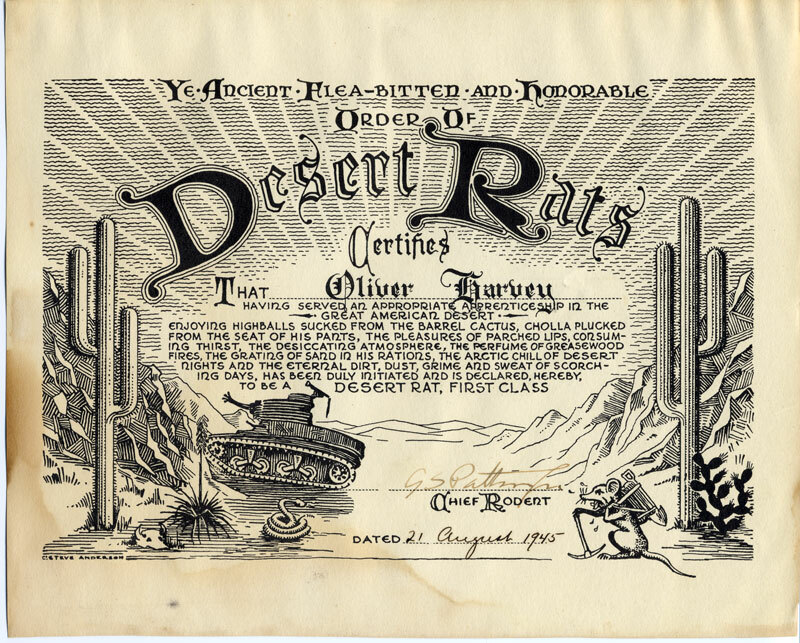 Original signed Certificate Inducting Oliver C. Harvey into General Patton's Desert Rats - "Ye Ancient Flea Bitten and Honorable Order of Desert Rats Certifies that Oliver Harvey having served and appropriate apprenticeship in the Great American Desert enjoyed highballs sucked from the barrel cactus, cholla plucked form the seat of his pants, the pleasures of parched lips, consuming thirst, the desiccating atmosphere, the perfume of greasewood fires, the grating of sand in his rations, the arctic chill of desert nights and the eternal dirt, dust, grime and sweat of scorching days, has been duly initiated and is declared hereby, to be a DESERT RAT, FIRST CLASS signed G.S. 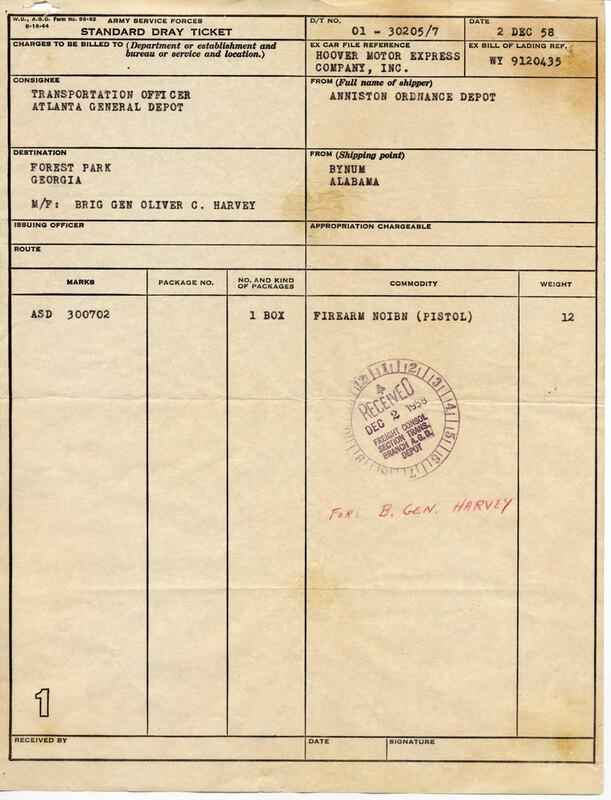 Patton, Jr., Chief Rodent, Dated 21 August 1945." 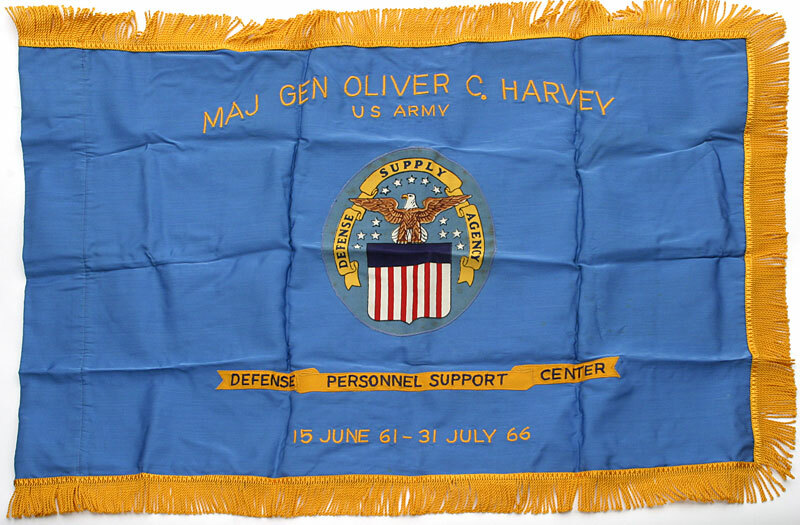 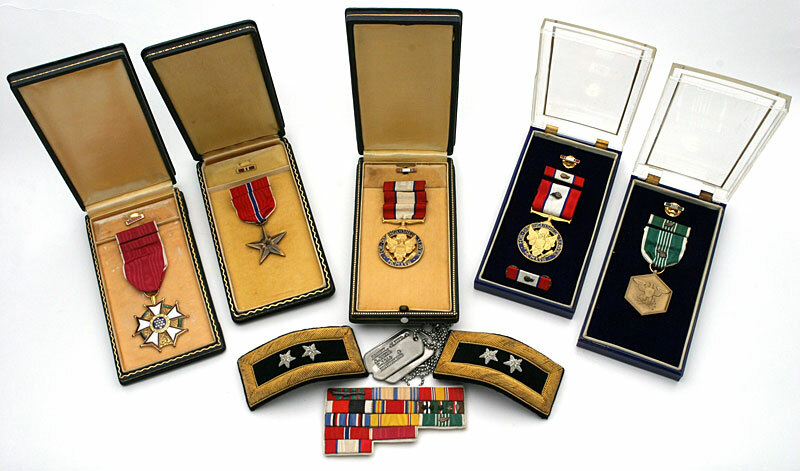 Some additional medals awarded to MG Oliver C. Harvey. 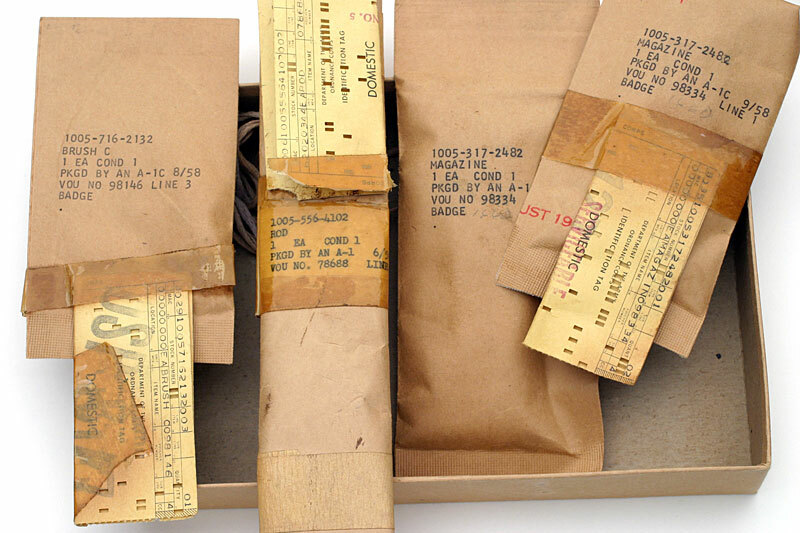 Much accompanied this set, including original wrapped accessories with IBM style punch card inventory tags for cleaning brush (1005-716-2132), cleaning rod (1005-556-4102) and two magazines (1005-317-2482). 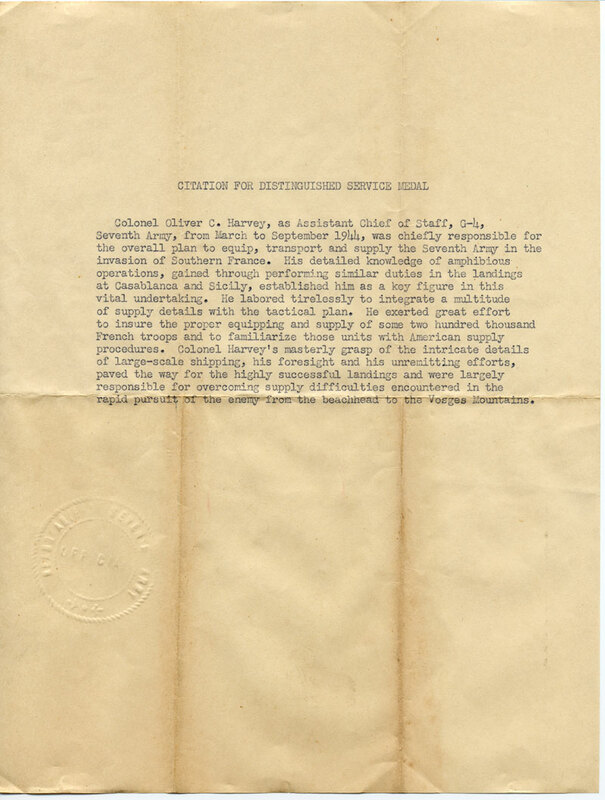 Letter from Rock Island Arsenal which documents the issue of Colt Model 1903 .32 ACP serial number 566926 to then Brigadier General Oliver C. Harvey. 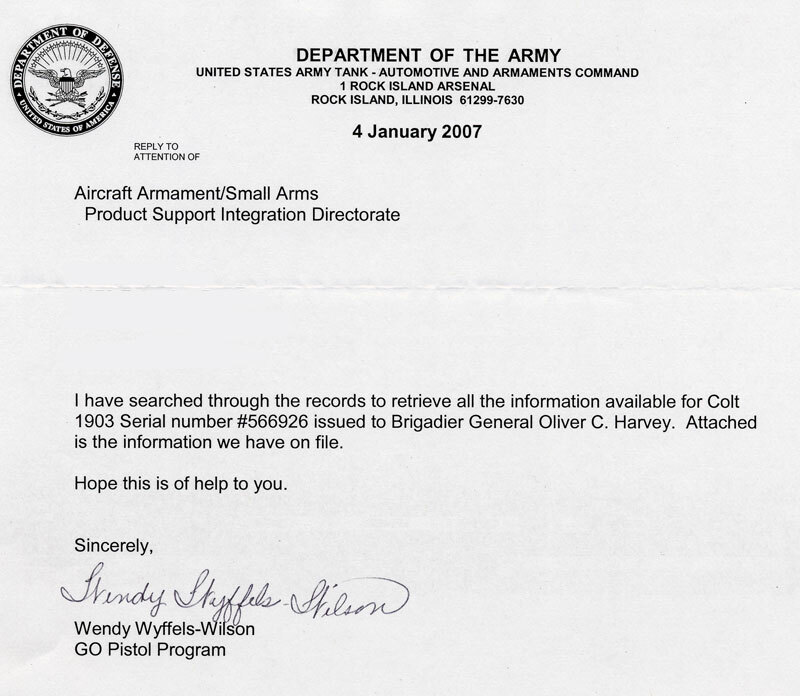 Copy of the database entry screen from Rock Island Arsenal documenting issue of "1 ea Pistol Auto Colt Cal.. .32" to Brigadier General Olicer C. Harvey on November 5, 1958. 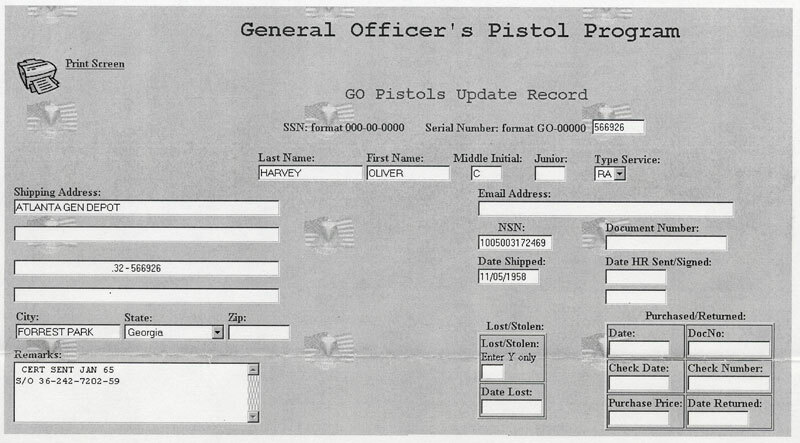 Pistol was shipped on November 5, 1958 to the Atlanta Gen Depot, Forrest Park, Georgia. 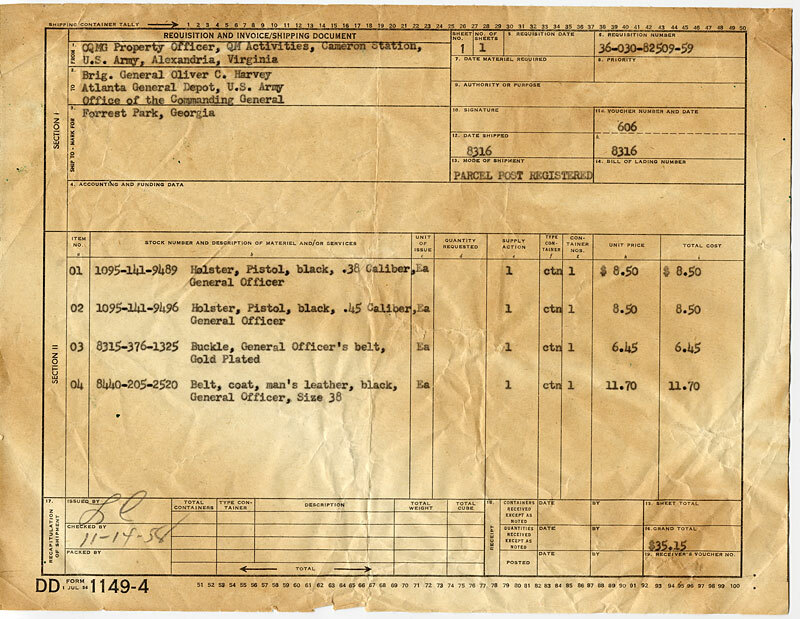 Standard Dray Ticket for transport and delivery of BG Harvey's Colt 1903 .32 ACP General Officer pistol. 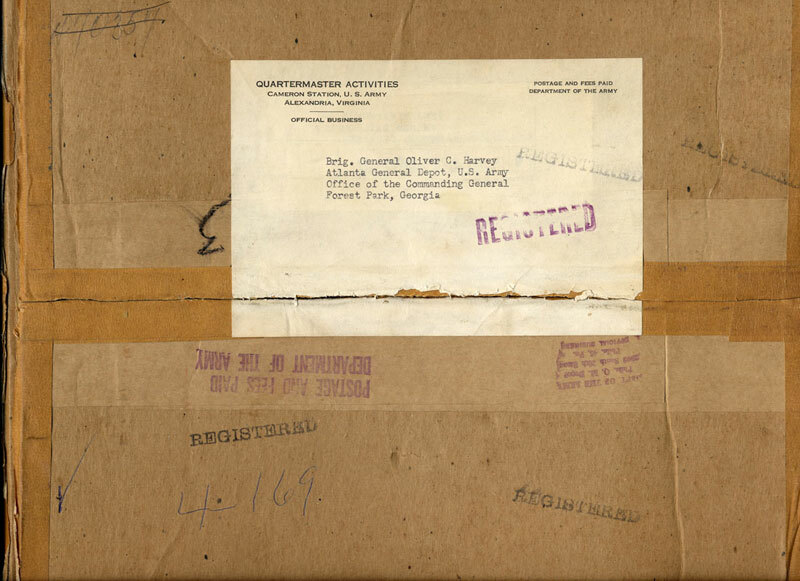 Original outer shipping box from the Quartermaster Activities department, Cameron Station, U.S. Army, Alexandria, Virginia, containing Brigadier General Harvey's General Officer's black belt, gold buckle, black 1911 holster and black 1903 Colt .32 ACP holster. 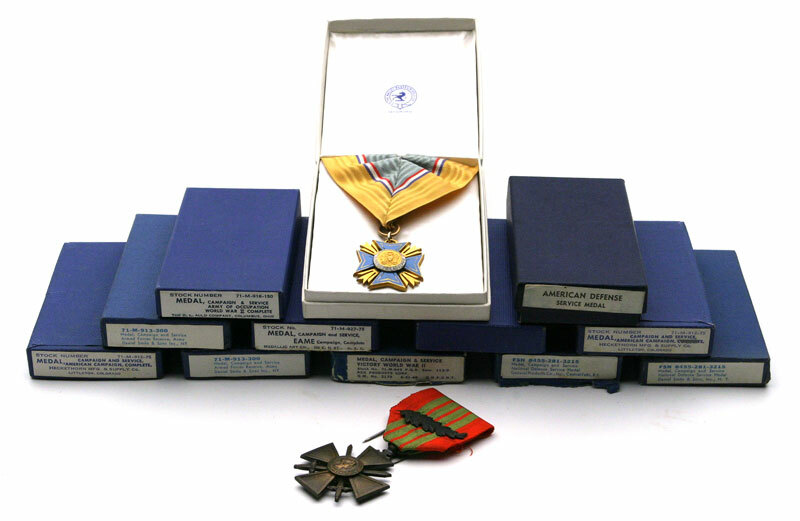 E-Armed Forces Staff College Grad Industrial College of the Armed Forces 1949 Command & General Staff School 5 Gold Star C1 41 2nd Lieutenant Infantry Reserve 1 April 33 to Brigadier General Army of the United States 6 October 1958, Regular Army, Captain Quartermaster Corps 5 September 1946 Date of Rank 17 July 1944 to Colonel 17 Dec 1958.